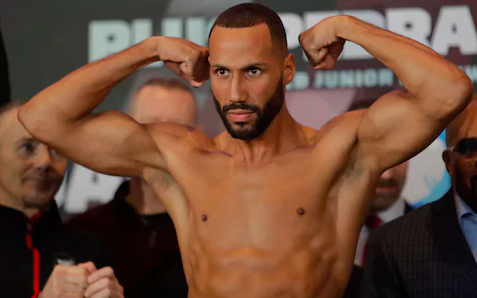 If James DeGale’s social media is anything to go by, he’s making the most of his life post retirement. The British star, who announced his retirement from professional boxing after losing to countryman Chris Eubank Jr. for the IBO super middleweight title in February, threw a boat party to celebrate hanging his gloves. Accompanying him were a few of his pals apart from a number of bikini-clad women. And DeGale appeared to be enjoying the time of his life as he soaked up the sun, enjoyed some drinks, danced and sang, recorded women twerking provocatively and took selfies with them. “Retirement party is mad,” he simply wrote the caption to his 140K followers. DeGale, 33, finished his professional career with a record of 25-3-1 (15 KOs). He held the IBF super middleweight title twice and defeated the likes of Lucian Bute, Andre Dirrell and Caleb Truax en route. As an amateur, he won the gold medal at the 2008 Beijing Olympics. He is also a Commonwelath Games bronze medallist and a two-time silver medallist at the European Championships.